This book is the third in Daniel Priestley’s vision of how to start and build your own business, and will be welcomed by the many who have or are considering a move out of the confines and comforts of salaried employment and into the exciting arena of entrepreneurship – running your own business, earning significant sums, being in control and changing the world. Priestley began the journey with ‘Key Person of Influence’ in which he explained how individuals can become valued and in demand in their own field of expertise. From there, he moved to the enterprise, discussing in ‘Entrepreneur Revolution’ the changing nature of business and how influential entrepreneurs can build a business around their expertise. 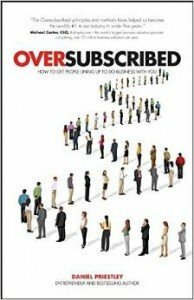 Now, with ‘Oversubscribed’, Priestley lets us into the secrets of how to turn that original small business into a significant performance business. At its heart Priestley builds on two principles: only businesses that are oversubscribed are tolerated and successful businesses have to be separate from the market, not the same as the market. Entrepreneurs also need one critical piece of information about their business – its capacity. With these principles and number in place, key business owners with influence in their industry can start to run campaigns to attract potential clients who can become paying clients and fill that capacity. Priestley asks business owners to stop communicating on a one-to-one basis, and change to communicating on a one to many basis, to run campaigns selling de-commoditised products in a structured buying environment, to become a Campaign Driven Enterprise. Interestingly, Priestley has published this book just as the issue of productivity is rising up the economic recovery agenda, and whilst ‘productivity’ is not a specific theme of the book, its underlying premise is that a campaign driven enterprise will be many, many times more productive than any other. Like its predecessors, this book is radical and inventive, going way beyond a conventional business studies course. At the same time there is a fundamental logic and structure to the thesis which is hard to refute. Written in Priestley’s usual energetic way, illustrated with case studies and examples from businesses large and small, and with plenty of detail on how to run remarkable, creative campaigns, this book is must read for anyone on the entrepreneur’s journey.